The Spokane Riverkeeper, and staff from the EPA and Idaho Panhandle Health Department will lead this free tour. Although downtown Spokane is many miles away from the Bunker Hill Mine, mining operations that began in the 1880s continue to impact the health of downstream waterways from the South Fork Coeur d’Alene River all the way to the Spokane River. The Coeur d’Alene Basin Cleanup is one of the nation’s largest and most complex Superfund cleanup sites; contamination comes from large waste piles, waste rock, and past air emissions from smelter operations. Attend this tour to learn about how pollution from upstream mining has impacted the Coeur d’Alene River, Lake Coeur d’Alene, and the Spokane River. Our Mining Legacy: Mining in Idaho’s Silver Valley for lead and zinc was largely unregulated until the late 1970s. Before that, an estimated 100 million tons of mine wastes were released into the Coeur d’Alene watershed. Primitive mining methods in the early days did not remove all the ore, and the environmental consequences of these practices were largely unknown at the time. Mine tailings were sometimes used in the construction of create towns, roads, and railroads, but were most often dumped directly into tributaries and onto the flood plain. Contaminants traveled downstream through Lake Coeur d’Alene, and were then deposited in some areas of the Spokane River. Most metals settled on the lake bottom, while others flowed into the Spokane River. Periodic flooding has caused the most movement of hazardous metals, such as lead, zinc, and arsenic, downstream. Impacts to Human Health: Lead and arsenic deposits at recreational beaches from the Idaho border to Upriver Dam can be a health hazard, particularly for children playing in the sand. Lead exposure can have multiple effects, including causing behavior and learning problems in children, nervous system damage, kidney damage, and reduced growth. Arsenic can cause cardiovascular disease, stroke, and changes in the skin. Several of the public boat launches along the Coeur d’Alene River have very high levels of lead, especially during spring floods. In an effort to reduce exposure to these metals, several beaches along the Spokane River have been cleaned up and/or capped with clean sediment. Impacts to Fish and Wildlife: In addition to direct impacts from filling streams and wetlands with tailings, metals released from the mining operations were so toxic to fish and aquatic life that the South Fork Coeur d’Alene River was largely devoid of fish for decades. Zinc is especially toxic to the aquatic insects that fish need to survive. However, much has been done to prevent this continued contamination, and fish have been making a comeback in recent years. Unfortunately, thousands of tundra swans remain at risk when they stop to feed in the marshes along the Coeur d’Alene River as they migrate north. 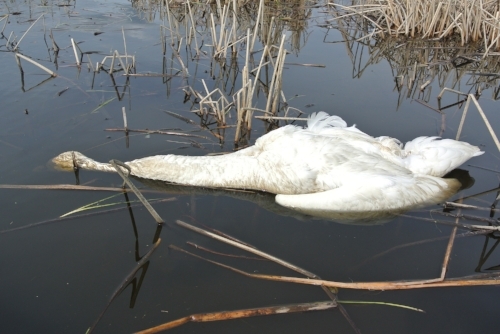 Because the swans feed on roots and tubers deep down in the sediments, they ingest high levels of lead, and many die. What’s Been Done: An enormous amount of work has been done to stabilize, encapsulate, and contain the pollution. Cleanup has been done on many properties, mine and mill sites, and areas where people live and recreate. Several huge improvements are underway this summer: a new treatment plant is being built to remove metals from surface and groundwater, and a groundwater slurry wall is being constructed to prevent zinc from flowing into the Coeur d’Alene River. Even though large restoration sites have been established, a complete cleanup will take decades. Tour Details: Attend this tour to educate yourself on this important site. We will see the former smelter area and zinc processing facility, one of the repositories where waste is stored, and view some remediated areas in Kellogg. Where: Kellogg, Idaho. Meet at the Idaho Department of Environmental Quality, 35 Wildcat Way, Kellogg, Idaho. Contact Lee First to register: lee@cforjustice.org or (509) 835-5211.
Who: Open to all Washington residents, free, registration is required. After registration, additional details will be provided.